This cut is a "little-known" way to get the best of both worlds: bones and meat. I like to have meat with the bone-in, in order to get the nutritional benefit of the collagen/gelatin and red/yellow marrow in the bones. Beef back ribs provide an ideal balance between meat and bones. Plus they're so delicious and easy to make. Many of our friends and customers have realized it's healthier and all-round better to consume more than simply muscle-meat, and they try to incorporate bones and organs into their diets. If you only consume muscle-tissue but ignore the bones and organs, you may be over-consuming tryptophan/cysteine and under-consuming collagen/gelatin and glycine. Just a few generations ago, people regularly ate meat with the bone-in, resulting in more nutrition as the bone's nutrients were liberated into the meat during cooking. Plus, they'd eat organs such as liver and kidney, and sometimes the lesser known ones too. This is true of many of the world's ancient cultures. But somehow food trends in North America gradually shifted away from bones and organs, and focused exclusively on muscle meats. Thankfully though, the pendulum is now beginning to swing back towards a more healthy, balanced approach to nutrition. Demand for bone-broth and organ meats is on the increase, as are cuts of meat which have the bone-in. Beef back ribs is a favorite cut of meat because of its very high bone-to-meat ratio. 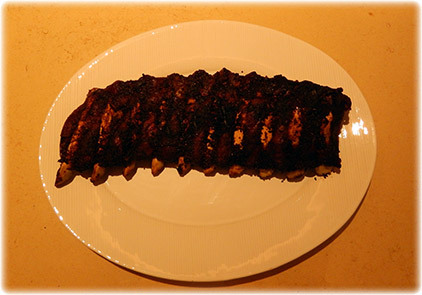 Plus, it is a nice presentation on the table, the long rack of ribs having an impressive look. I've put together a simple recipe you can quickly prepare which our family likes and hopefully yours will too. I adapted the recipe from this one at The Meat Source. 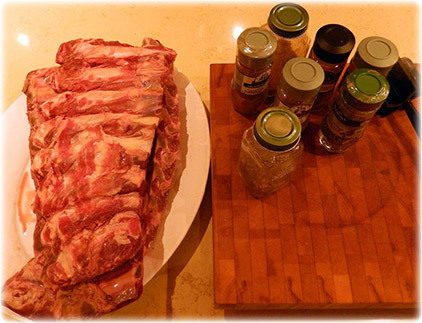 By way of background, beef back ribs are similar to pork baby back ribs but are much larger. They also don't need to cook for as long as pork ribs do, especially since grass-only beef back ribs require about 30% less cook time than grain-fed beef. 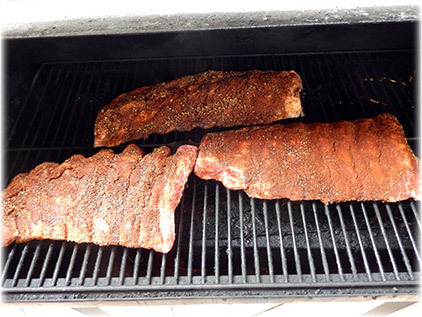 In the recipe that follows, I will be grilling the ribs with dry heat, but you could just as easily braise them or cook them using some other means. For this recipe I like the dry heat of a grill and, since we use a wood-chip grill, the meat picks up the smokey flavor of the wood-chips which is an added benefit. Before you get started, remember to check to see if the beef back ribs still have the thick membrane attached to the bone-side. Sometimes the butcher will remove the membrane, although sometimes not, so you should check. Although you can cook the ribs with the membrane intact, I prefer to remove the membrane and discard it. The membrane, if present, is almost like a thin sheet of paper-thin white tissue on the bone-side of the ribs, and will peel away quite easily. Here's a simple description to help you (this is a pork rib description but it is applicable to beef ribs too). 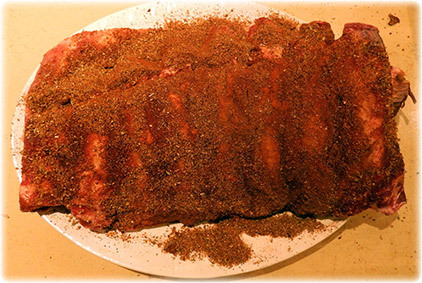 Once you've mixed the spices, season both sides of the ribs with plenty of rub, then cover and let sit in the fridge for a few hours or preferably overnight. When you're ready to grill them, get the temperature to around 275 degrees and place the ribs on the grill. Turn them every 30 minutes, and cook them for a total of no more than 90 minutes or they will tend to dry out (remember, grass-only beef cooks faster). Once you remove the ribs from the grill, wrap each rib in foil and put inside a paper bag, and allow to rest at room temperature for about an hour. This will continue to improve the tenderness of the ribs. Once the hour is up, they're finished! Serve them and enjoy a healthy, collagen-infused, marrow-and-glycine rich set of back ribs. Of course, our certified organic grass-only beef back ribs are our favorite, and you can buy them here.